Early in the year the Christians number the eight hundred and forty-fifth after the death of their God the White Christ, my fate led me to the outskirts of Hedeby, the largest town in all the kingdom of the Danes. I arrived there in the late afternoon, tired, hungry, and sore from spending many days atop a horse. At least I had not suffered too badly from the cold on my journey. Though by measure of days it was still the last weeks of winter, the weather had been unseasonably warm ever since the Jul feast, and on the day I reached Hedeby there was a freshness in the air that hinted of the coming of spring. Hedeby was not just a town. It was a fortress that squatted, fat and solid, against the shore of a shallow inlet along one side of the Sliefjord, a long, narrow gash of the sea cutting deep into the eastern coast of Jutland. A deep ditch ran in a half circle from shore to shore around the entire town. The earth dug from the ditch had been piled behind it to form an earthen wall, which was topped with a wooden palisade. I paused my horse at the edge of the woods and stared out across the open land that lay between me and the walls of Hedeby. Because of the season, the fields were still bare, with only low, weathered stubble from the remains of last year’s crops showing gray against the soil like a grizzled growth of beard against an old man’s cheek. My mare tugged impatiently at the reins, urging me toward the food and shelter to be found in the town. She’d been mine only a matter of days. I had taken her from a dead man. Indeed, much of the gear I carried — my iron helm, my shield, my leather jerkin and small-axe, and even the meager hoard of silver pennies in the leather pouch at my belt — I’d taken from men who were dead. Men I had killed. Only the clothes on my back, the long, heavy bow I carried, and the fine dagger in my belt were truly mine. The dagger had been a gift from Harald, my half-brother and my teacher. He’d given it to me to honor my attaining the age of fifteen, and manhood. It seemed so long ago — had it truly been only a matter of days? The dagger was one of two gifts Harald had given me that night. The other was my life. Still concealed within the final fringe of trees, I ignored my horse’s urgings and sat staring at the town. It was not too late to turn back, and I dearly wished to, for my heart had suddenly filled with fear. Fear of the unknown, in part, for I had never seen a town so huge, nor even imagined so many people together in one place. Even more, though, I was afraid I would not measure up to whatever lay ahead. I feared the fate that the Norns, the three ancient sisters who set the course of all men’s lives, were weaving for me. How could I possibly succeed at the tasks ahead of me? By my years I was now reckoned a man, and admittedly I was tall and strong for my age. But I was alone, all alone, and in my heart, a part of me still felt like a child and longed for someone to turn to for guidance. There was no one, though. All whom I had previously relied upon in times of need — my mother, my brother, even his men — were now dead. The Norns had cut their life-threads and left me to face my fate on my own. Shame at my own cowardice finally drove me forward. I knew I had to face my fear and overcome it, or I would dishonor myself. I owed a blood-debt. I had deaths I had sworn to avenge. I kicked my heels against my mare’s ribs and we headed down the road that led through pastures and fields toward Hedeby’s gate, gaping like a missing tooth in the wall surrounding the town. Ahead, the road crossed a dry moat over a wooden bridge and disappeared through the opening in the wall beyond. As I drew nearer, I saw an armed warrior was standing guard on the wall beside the gate. He watched my approach, looking out over the sharpened points of the stockade’s timbers with a bored expression on his face. The late afternoon sun glinted on his polished helm and mail brynie, and made the sharpened blade of the spear he held flash like fire. My horse’s hooves thumped across the planks of the bridge like a slow drumbeat. As I reached the opening in the wall, three more warriors came into view, squatting on the rampart behind the guard, rolling dice. They were, I knew, warriors from the king’s household, royal housecarls who’d been commanded by their lord to protect the town and collect the king’s share of the trade that passed through its busy market. I wondered if they were on the lookout for an outlaw and murderer. That was the lie told about me by the leader of the men who’d killed my brother, Harald. Had the tale made its way this far south? Had it reached Hedeby before me? I forced a blank, unconcerned expression on my face as I rode through the gate, though my stomach felt twisted into knots and I had to remind myself to breathe. I was prepared to wheel my horse and ride for the forest if the guard challenged me, but he did not. As I passed him he leaned his spear against the log wall of the palisade and squatted down to join his companions’ game. I breathed a silent sigh of relief and entered the town. Once inside the wall, the dirt track I’d been following became a paved road, surfaced with thick timbers laid side by side in the earth. A short distance off the road, in the band of open ground encircling the town inside the perimeter of the wall, two pigs were rooting in a heap of garbage. They looked up at me briefly as I neared, then plunged their snouts back into the noisome mound. A small boy watching them swiveled his head as I passed, following me with his eyes. After the many days I’d spent in the open on my journey down Jutland, crossing windswept heaths and dark forests, the smell of the town was overwhelming. Odors of rotting garbage, animal dung, and human waste blended unpleasantly with whiffs of food cooking. Smoke from countless fires overlaid all. A barrage of noise assaulted my senses, too. Dogs barked, pigs squealed, chickens cackled, cattle lowed, and men and women strode up and down the road, babbling back and forth to each other. Though it had appeared large to me when viewed from the edge of the forest, the town felt even more daunting once I was inside its walls. I felt as though I had wandered into some vast maze. Alleys branched off frequently from either side of the main road. They were lined with houses, row after row of them, all much smaller than the great chieftain’s longhouse I’d grown up in. I did not understand how people could bear to live this way. Why would they wish to? Finally I reached the town’s center. The road opened there into a square of bare, open ground. From the crowd that bustled within, it was obvious this was Hedeby’s famed market, where goods from the farthest corners of the world could be bought or sold. The perimeter of the market square was lined with small fenced pens, containing sheep, cattle, and squealing pigs. Just beyond them on a low platform, a different kind of beast was being displayed for sale. Three children, two boys perhaps ten years of age, and a considerably younger girl, were squatting in the center of the platform. They looked dirty and hungry, and were wearing only ragged tunics, whose substance appeared to owe as much to the filth caked on them as to the coarse wool they were woven of. They were slaves. It was obvious from the thin ropes looped around each of their necks, tying them together. Even without the bonds, though, I’d have known. I recognized the dull, defeated look in their eyes. I understood why it was there. Where, I wondered, had they been taken? What land had they been snatched away from? What had happened to their homes and their families? Turning away, I stood up in my stirrups and scanned the market square. Surely almost anything a person might want or need could be found here in Hedeby. What I did not see, though, was what I most hoped to find. I needed to sell my mare and her tack. Her service to me was done, for I had come to Hedeby to join the crew of a ship, a longship hopefully, bound i-viking. But none of the animal pens around the square contained horses, and nowhere I looked did anyone appear to be haggling over mounts. Indeed, there were few horses in the square at all, and those I could see looked to be objects of transportation rather than trade. I did not know where to turn. It should have been a simple thing. The market was full of people. I had only to ask someone where I might find a buyer for my horse, but I feared appearing a fool. I feared looking like what I was: a green youth from the countryside. As I took one last discouraged survey of the market square, I caught a glimpse, through a momentary gap in the crowd, of a man intent on a task I’d labored at many times myself. He was short and lean, with a weathered face, seated on a low stool holding a long, narrow stave of wood angled across his lap. He drew a thin, flat piece of steel down the stave in long strokes, shaving fine curls from it, searching for the shape of the bow concealed in the wood. I’d performed the same motions countless times myself in the work shed of Gudrod, the carpenter on my father’s estate. Watching someone labor at so familiar a task somehow made Hedeby seem less strange and threatening. I climbed down from my horse’s back and led her closer to where the man was working. As I drew near, I saw three bundles of arrows and a finished bow — the wares he was offering for sale — arrayed on the ground at his feet. The man glanced up, saw me staring at him, and studied me and my horse. “My name is Raud,” he said, “and if you’re looking to buy a bow, or arrows for one, you’ve come to the right place. Though it appears you have a bow already,” he added, nodding at the bow clutched in my hand. “I can use it,” I answered. There was a great deal I felt uncertain about, especially since arriving at Hedeby, but that much I knew to be true. I handed it to him. He rubbed his hands along the long limbs, caressing the wood, and closely examined the sharpened horn nocks, decorated with narrow bands of hammered bronze, which capped each end of the bow, pursing his lips and nodding appreciatively all the while. Finally he stretched his arm out and let the bow balance across his palm. “May I string it?” he asked. I nodded. He stood, bracing the bow against the arch of his foot, and bent it, sliding the loop of the bowstring up into the top nock as he did. Grasping the leather-wrapped grip, in one smooth motion he pushed the bow forward with his left arm while pulling the string back with his right, coming to full draw. He held the bow there briefly while he studied the curve of its limbs, then eased the string forward. Still not speaking a word, he unstrung my bow and handed it back to me. I shook my head. “I’ve been on the road for many days, sleeping in the open. I can do it again,” I replied. “Thank you,” I said. “I appreciate your kindness.” And in truth, the thought of sleeping inside again, with more than just a cloak and a low, open fire to fend off the night’s chill, sounded very welcome indeed. Raud bent down, picked up his bundles of arrows, and handed them to me to carry. I blushed, embarrassed that I had forgotten my manners. “My name is Halfdan,” I said. Raud led me across the market square and through a series of progressively narrower alleys. Finally he stopped in front of a small house and unlatched the gate in the fence around it. The yard contained a pen confining a sow and five piglets, and a garden with chickens hunting for bugs among rows of cabbages. Raud’s wife, Asa, was a plump woman with brown hair plaited into two braids. Her clothes, Raud’s, and their home itself suggested they were poor folk. She had a friendly face and a warm smile, though, and quickly made me feel welcome. Inside, Raud and Asa’s house contained just a single room with a raised hearth in the center and low benches built of wood and packed earth lining three of the walls. A loom stood against the fourth wall, as did two wooden chests, one large and one small. We ate our dinner on a small tabletop that Asa and Thora had taken down from where it hung on one of the walls, and set up across the smaller of the two chests. Thora was determined to be the only person who served me, and sat beside me at table, hanging on every word I spoke. Her attentions caused me much embarrassment, and Raud and Asa much mirth. Dinner was a hearty stew, with barley, onions, carrots, and chunks of fish, all cooked in an iron pot suspended over the fire. For too many days I’d lived on whatever small game I could kill and roast, unseasoned, over an open flame, or on dried, salted, pork when nothing crossed my path in range of my bow. Though the stew was simple, to me it tasted wonderful. As we ate, Raud told Asa how he’d met me. Thora looked at me with big eyes. “Are you a warrior?” she asked, surprise evident in her voice. I felt dismayed by her reaction. If I did not appear a warrior even to a ten-year-old girl, how could I hope to convince a ship’s captain I was one? Asa seemed surprised, too. “What does your mother think about this?” she asked. Her question so startled me that I swallowed some soup down the wrong way and choked on it, coughing broth out through my nose. Raud looked embarrassed for me. “Asa,” he scolded, “a grown man does not need his mother’s permission to go to sea.” He turned to me with an apologetic look on his face. “Gisli was his name. He was so young,” Asa said. “Too young for war. Too young to die. He hadn’t had a chance to live. You look young, too,” she added. I did not know what to say. If her loss still pained her so, I did not want to risk stirring her memories up even more. I chose instead to answer her earlier question to me. Actually, my half-sister, Sigrid, still lived, but she was as if dead to me. She was now in the power of my enemy, the man who had killed our brother, Harald. It was my turn to feel embarrassed for Raud. No man likes to be scolded by his wife in front of guests. Raud’s face turned red. He set his bowl of stew down on the table, stood up, and walked across the room to where the bow stave he’d been working in the market was now leaning against the wall. After he left, Asa spoke to me. When I joined him outside, Raud shook his head. “Pay no mind to Asa,” he said. “The Viking life is a good life for a man. I miss it. When her brother died in my care, though, I felt I owed her. She has been a good wife to me. 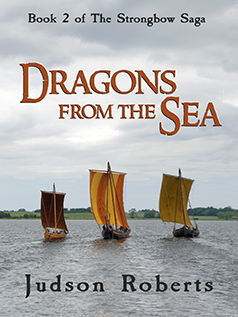 “I heard in the market that several longships came into Hedeby harbor today,” he continued. “It’s likely at least one will need more crew. We’ll sell that horse of yours in the morning, then you can seek out the ships’ captains down by the shore. I wondered if Asa’s brother would have agreed.